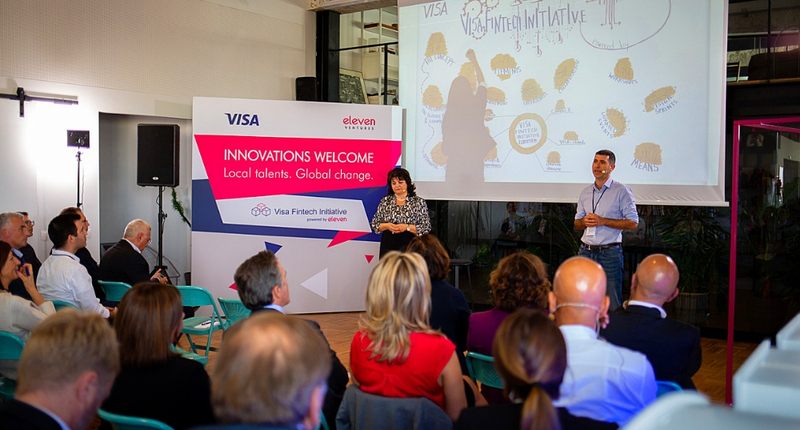 Today Eleven is joining forces with Visa to create the first fintech innovation program that will be orchestrating the future of digital payments and commerce in Bulgaria. The initiative will encourage the dynamic interaction and real-time experimentation between Visa’s clients and partners to design and prototype new fintech solutions together with our growing community of startups and entrepreneurs in the country and across the region. With the Visa-Eleven Fintech Partnership, we will be looking for the most talеnted startups who enhance the traditional financial services offering for end consumers and businesses. At the same time, we stimulate the creation of meaningful and innovative consumer experiences by moving from manufacturer focused to a human-centred design approach. This partnership is a step towards our model of helping startups achieve better capital efficiency. During the last 5 years we learned that the best support for founders in early stage has two main components: 1) Sufficient funding for a 12-18 month horizon and 2) Access to clients and in particular corporate clients for the startups. While we are providing the first element, Visa and the current initiative can provide the necessary boost for startups to reach local and global customers via Visa network (the access to market) but also scale-up through the Visa technology platform. Startups will be in a better position to build products and services with Visa’s clients in a co-creation manner from day one, overcoming the trenches of the fintech industry that are probably the biggest challenge for them today. We are also excited that we could help the local fintech industry (banks/ merchants) to become more innovative through active collaboration with the startup and tech community at large. Eventually, we shall be in a position to contribute to the innovation in the fintech global field with locally born concepts. Engagement: The Program’s immersive environment provides the fintech startups with everything they need to work on specific ideas or existing business and industry challenges – from top payment experts’ advisory, networking and mentorship within Eleven’s community, to access to the latest developers’ infrastructure, available at Visa’s Developer Center. It provides simplified and user-friendly access to many of Visa’s most in-demand products and services, allowing anyone to transform great ideas into new digital commerce experiences, meeting the industry standards. Experience: Via curated design sprint workshops for dynamic interactions and real-time experimentation, led by our partners from the design-thinking studio Creative Shower, the concepts will go through different phases – from new technologies rapid prototyping to market validation – to prove their flawless consumer adoption and tangible market value. Collaboration: The multifaceted open approach to the entire ecosystem of innovation will utilize the creative environment and great community of startups, IT talent and entrepreneurs at Campus X, where all experts will gather to streamline their energy for innovation and co-creation. With its extended working and community space, Campus X will host the daily activities of the program and will also provide both venue and talents for the tailored meetups and developer’s hackathons, part of the Program. Inspiration: We know how hard it is to work on a startup. First, our team and community will be a constant support for you. Whether you have an emerging idea or ready to go solution, reach out to us for a bit of advice or inspiration. Second, through a specially selected set of expert events and meetups, we will be deeper exploring the changing world of fintech, ensuring that you are always on top of the latest global industry trends. Building an innovation program which aims to pave the future of digital payments and commerce is not an easy task. We are committed, however, to give our best helping startups thrive in changing the world of financial technologies. The question is: “are you joining us”? If you have an emerging idea or ready to go solution check out the initiative and drop us an email. If you want to be up-to-date with upcoming events, international guests, workshop and hackathons in the field of Fintech, subscribe for our updates.